If you liked the simple charms of the animated movie, A Bug’s Life, (and let’s face it, there are plenty of you out there) you’ll enjoy this. 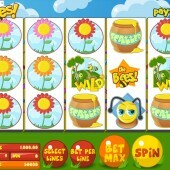 Packed with bright and garish graphics, this is a simple, clean slot from fun-loving slot developer Betsoft Gaming – The Bees. 9 Paylines of Sticky Fun! 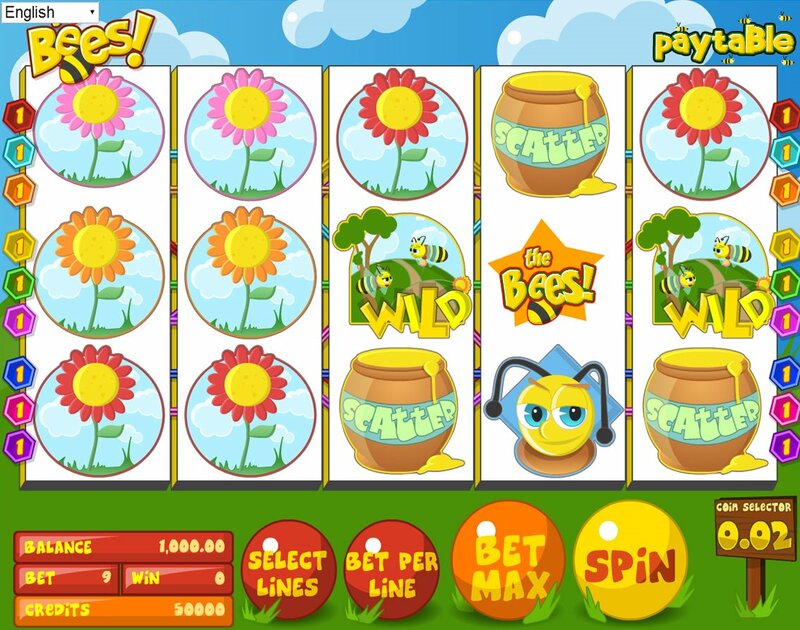 More akin at first glance to some children’s wallpaper than a serious online slot, The Bees is a 5-reel, 9-payline slot set firmly in a world of love-struck bees, colorful flowers and hives. On the reels we get our Bee friends, a few varieties of flowers, a hive, and a Scattered honey pot. The Scatter honey pot pays out a 2,500-coin jackpot if you hit five across the reels. Meanwhile, the Wild icon subs for all regular symbols other than the Scatters. Five Wilds on the reels will activate the ‘Reel Launcher’. Here the Wilds will re-align to form a random winning combo. Swap the Icons to Win More! There’s another hidden extra about the main game, however – after any normal spin that results in a winning pay-line players can swap two icons to make more winning combos. The game’s bonus round is triggered by hitting the male bee, the bees Scatter, and the female bee in consecutive order on Reels 2, 3, and 4. 'Swap' icons can be collected (up to three in total) during the bonus round. After you have triggered the bonus, you’ll get to choose a character that you have to guide through the hillside and collect awards that give extra credit, time or swap icons. While not winning any awards for innovative graphics, the Swap Icons feature is certainly a new one on me, and the Bonus round is interesting if seemingly impossible to trigger. But for fans of vector graphics and a nice time, this is for you. There are plenty of cutesy insect-themed slots out there, and it’s not hard to find a few that offer the same simple pleasures as The Bees. NextGen Gaming’s nature-themed slot, Butterflies, is a great must-play, while Rival Gaming’s beautiful seasonal slot, Secret Garden, offers up a veritable cornucopia of great graphics, roses galore, and a nice soundtrack to boot.